This event was very successful! Thanks for all who attended! Don’t miss out on future events, be sure to check back on the website soon for the most recent news. Also CLICK HERE to view information and register for our annual conference! CSR Panel Discussion – Bitu Cao- Minh – J Crew, Roger Ducharme – Tanya Creations, Suzanne Calvin – Fiesta Jewelry. Panel discussion on the FJATA Compliance Management Program by compliance executives from participating companies. FJATA and Sumerra are pleased to announce their second annual collaborative meeting for brands, retailers, licensees and manufacturers of FASHION JEWELRY AND ACCESSORIES. 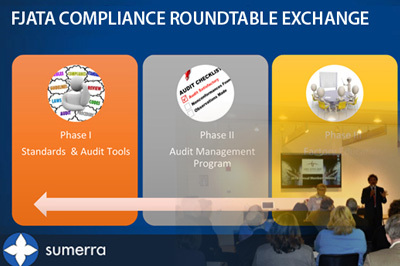 Don’t miss out on this opportunity to learn more about the FJATA Compliance Management Program and network with companies who are already using the FJATA Audit. The secret to easy compliance management is the FJATA Audit! Let FJATA and Sumerra do all the work for you and your team. This collaborative event will provide a unique opportunity for a select group of industry executives to learn, network and partner on compliance solutions that will create needed advancements for the industry on a global scale. Reserve your seat at the table today, make FJATA Compliance Management part of your CSR strategy for 2017! Cocktails and networking immediately following.